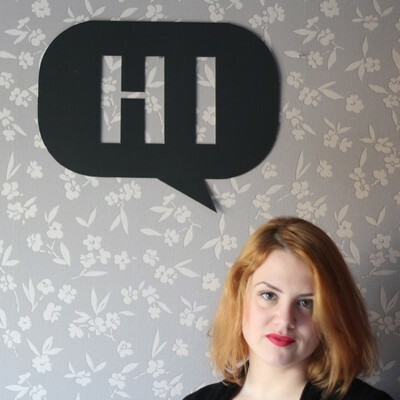 This is a really simple project that makes a big visual impact - and best of all, it doesn't require any specific craft skills. 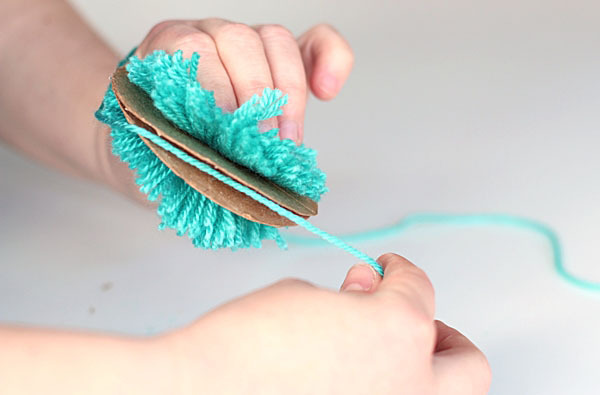 Basically, if you can wind a piece of string around a bit of cardboard, you can make a pom-pom. 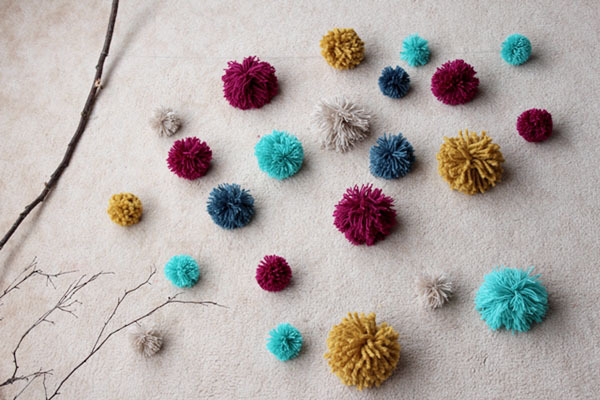 But the trick to this specific project is creating enough pom-poms to make a statement - and of course, your choice of colour palette. 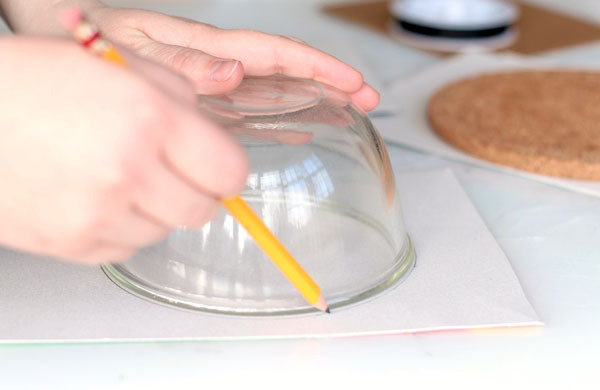 Click through for the step-by-step how-to. Wool yarn in five different complementary colours. Six pieces of 20 x 20cm (8 x 8in.) cardboard. Slim scissors or a cutter. You will need three pairs of discs in different sizes. 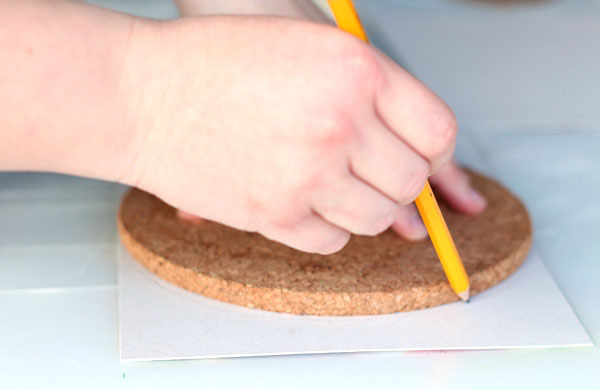 To make the discs, use six pieces of cardboard of about 20 x 20cm (8 x 8 in.). I recycled cereal boxes instead of buying new cardboard. 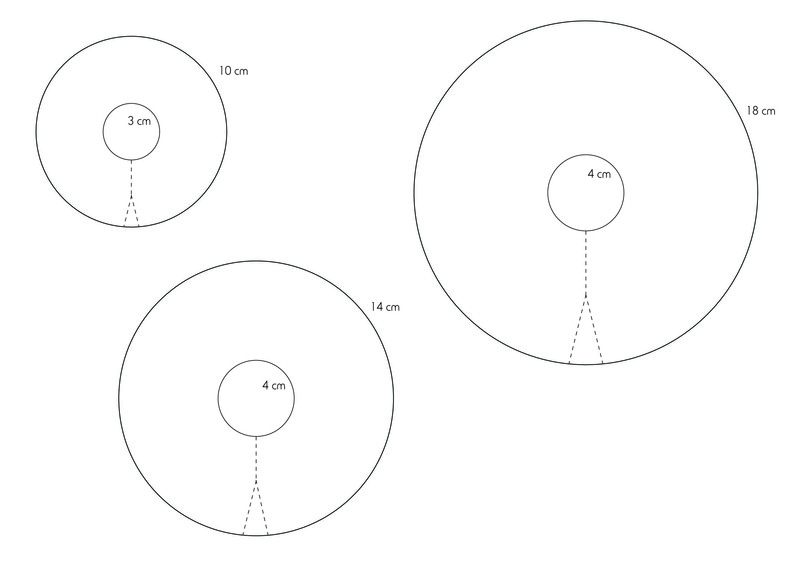 Use the free printable template below (print it on A3 page in landscape) to create your circles, or just trace around circular objects around the house. You will need two circles of 18cm (7 in. ), two circles of 14cm (5.5 in.) and two circle of 10cm (4 in.). 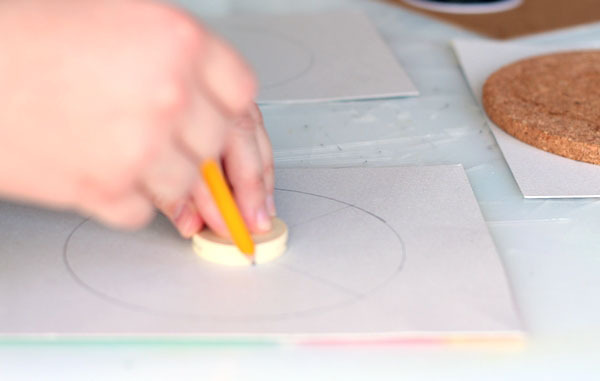 Now draw a concentric circle of about 4cm (1.6 in.) inside each of the circles. 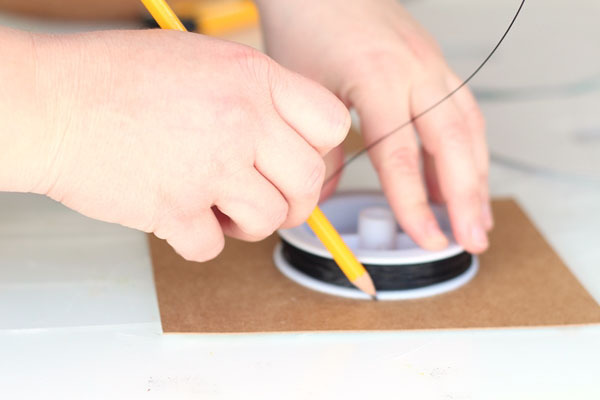 For the smaller circles, make an inner circle about 3cm (1 in.). 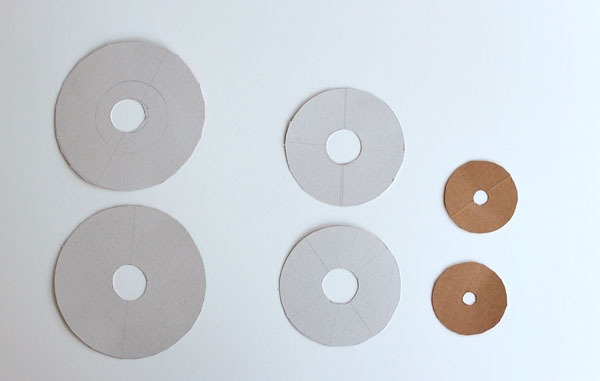 These inner concentric circles mark the central hole in each of the cardboard discs. 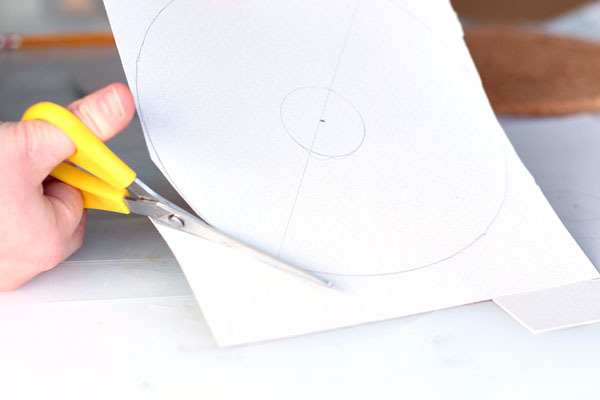 Cut around the outer circle using a pair of scissors. 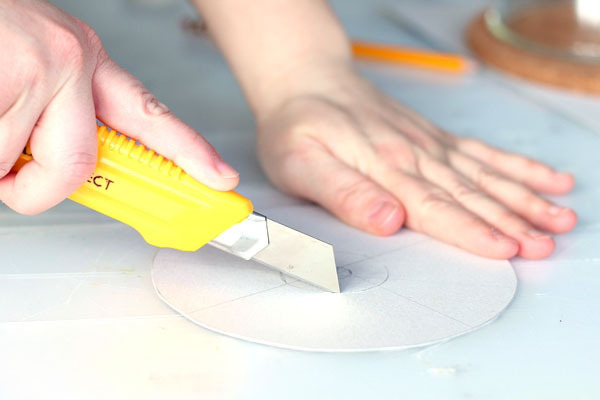 Now, using a cutter, cut-out and remove the inner circle to create a hole in each disc. At this point you should have three pairs of discs in three different sizes, each with a hole in the centre. Take a pair of discs and place one on top of the other. Cut a long piece of yarn of about 1.5 to 2 metres (60-80 in.). After a bit of practice you will figure out what length is best for you. Take one end of the yarn and pass it through the central hole and hold it there with your thumb. 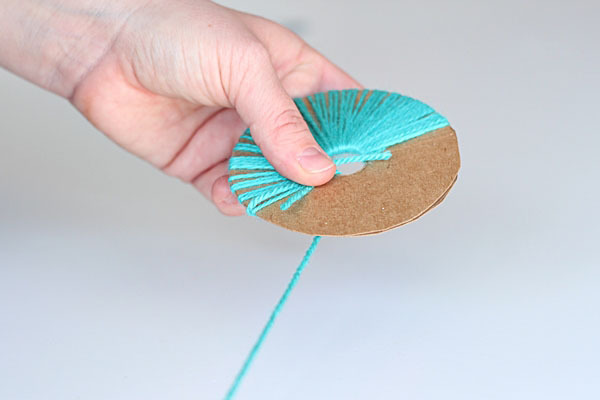 Pull the yarn through the hole and wrap it around the two discs. Place it tightly over the first end to secure. 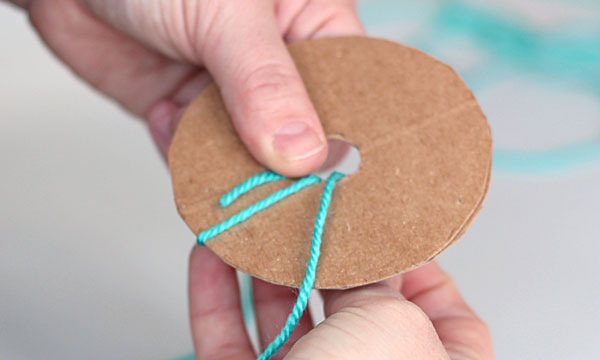 Keep on pulling the yarn through the hole and wrapping it around the discs. The central holes should be big enough for you to pull the yarn through with your fingers. 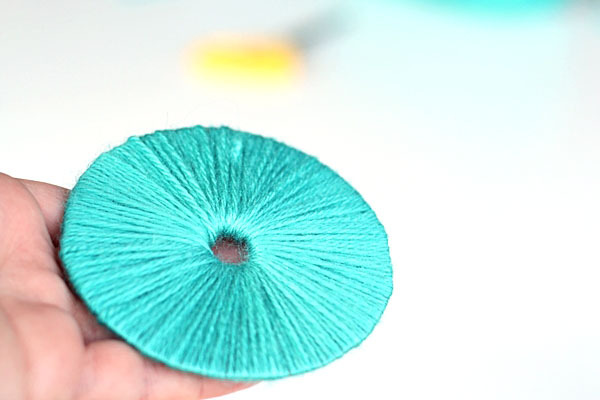 If you're finding it difficult to pull the yarn through the hole, you could cut a radius in your disc (see the dotted line in the pattern) to make your yarn wrapping faster and easier, however I think it makes the disc slightly unstable. 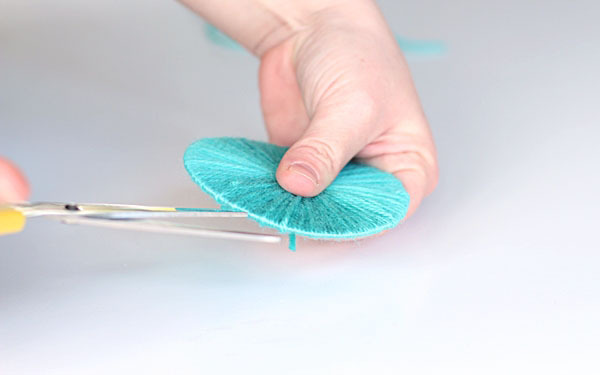 Another option is to use a large needle (like a darning needle) to help you feed the yarn through the hole. At some point your yarn will end, but you haven't finished wrapping your discs. 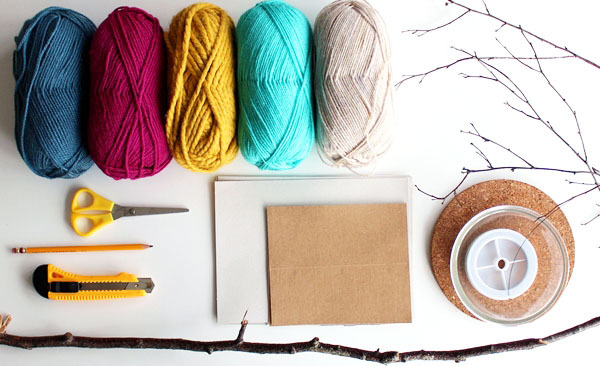 Just add another piece of yarn, in the same manner as your first piece of yarn, and keep on wrapping. 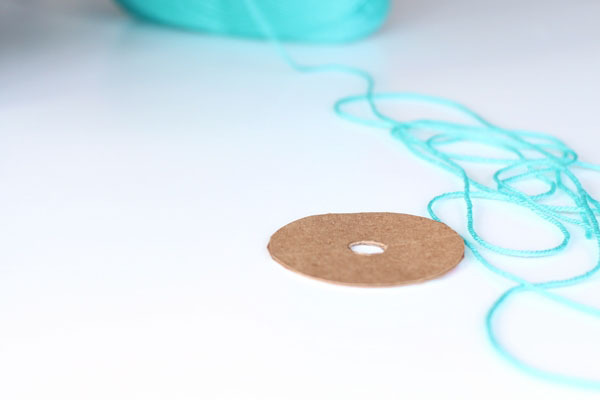 Wrap over the new piece of yarn several times to secure it in place. 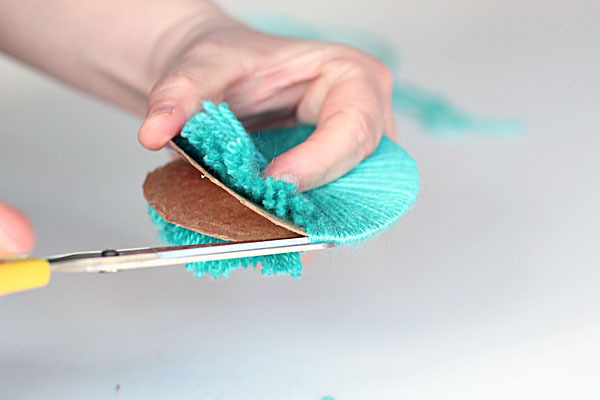 You need to wrap around your discs at least twice so that they are completely covered with wool. This step will take a while, but it will ensure your pom-poms are nice and full. 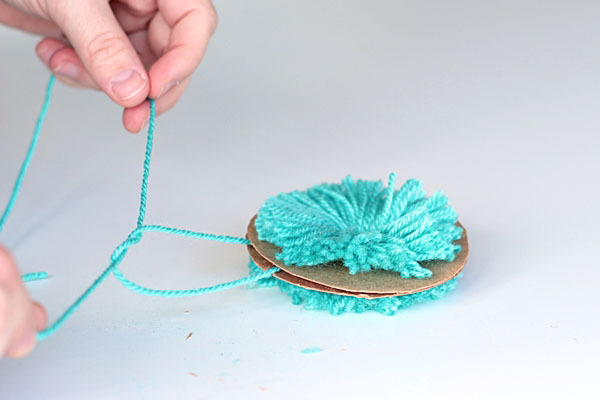 Basically, the more yarn you add to your disc, the fuller your pom-pom will look. 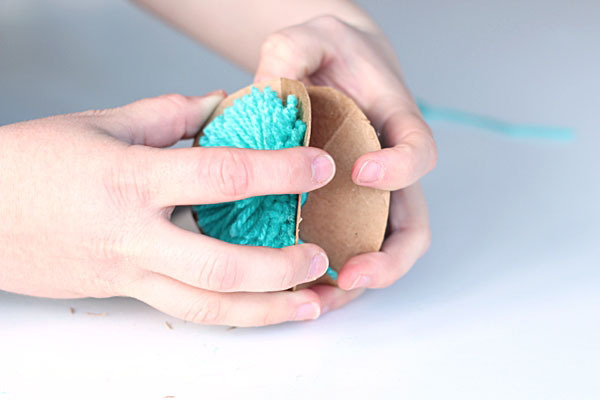 Once you're comfortable with the wrapping technique, you can speed-wrap by using multiple pieces of yarn. 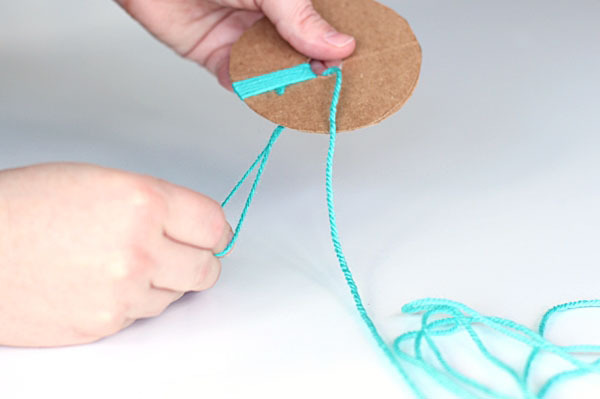 Or simply fold your piece of yarn in half and wrap it double-time. 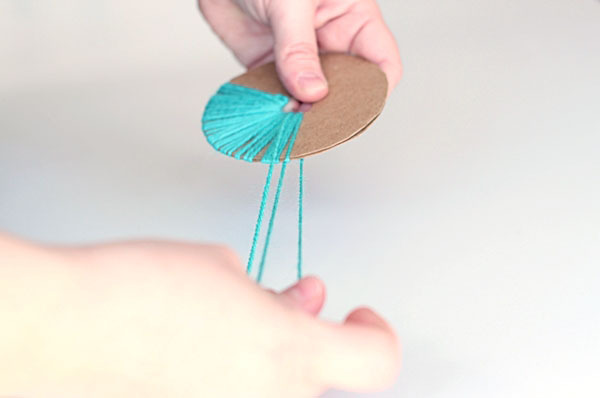 Once you've covered your disc with yarn, cut a short piece of yarn about 40cm (16 in.) long. You will be using this in the next step but it's best to have it on hand now. 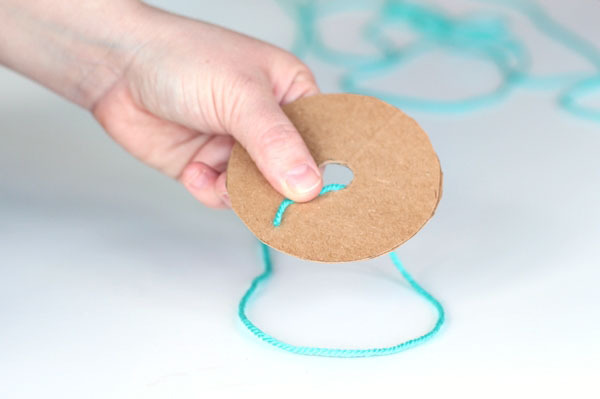 Now, slip your scissors or cutter under the yarn and between the two cardboard discs and start snipping around the edge of the circle. An embroidery snipper or a pair of sharp nail scissors can also do this job nicely. 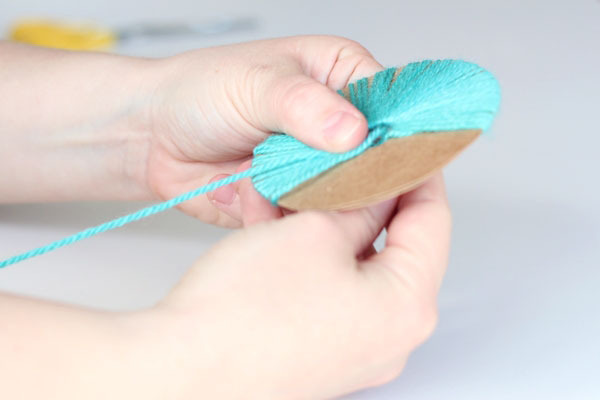 Once you get started, you'll find it's easy to cut around the perimeter, but if you've wound a lot of yarn on to your discs, it might take a bit of time to cut carefully through the layers. 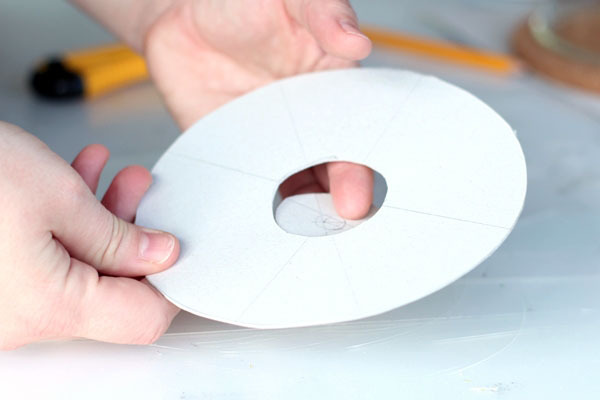 Keep a firm grip on the centre of the disc so it doesn't start moving while you snip around the edge. Try to keep your snipping nice and even. 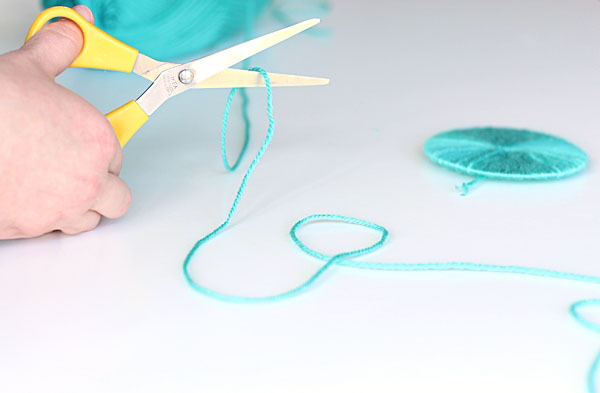 Once you've snipped through all of the yarn, grab the short piece of yarn you cut earlier. 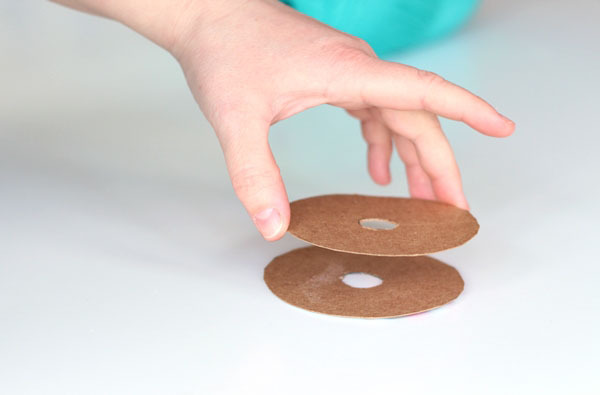 Slide it between the two cardboard discs and wrap around firmly. Knot the piece of yarn and pull. As you pull, you will see the pom-pom gathering towards the centre. Tie the knot firmly and knot at least three times. Trim the excess ends. 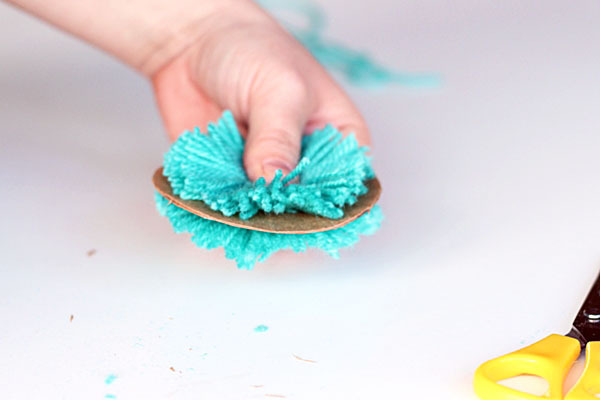 Once your pom-pom is secured tightly together, you can remove the cardboard discs. Carefully slide them over the yarn and put to one side. 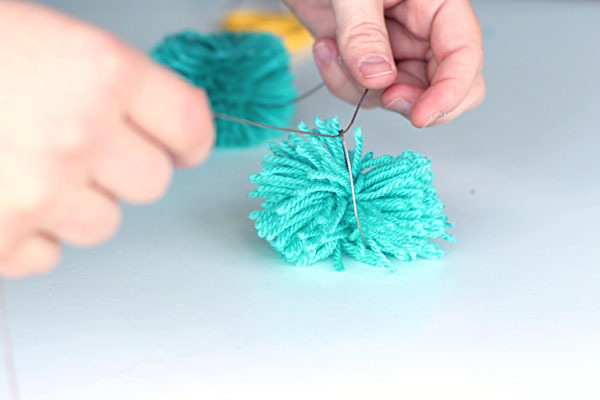 Your pom-pom is almost finished. 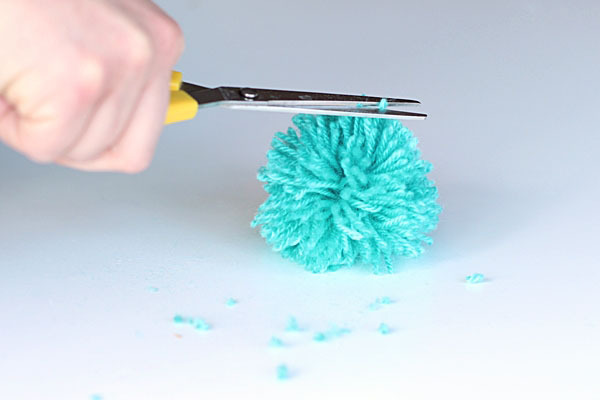 All you need to do now is fluff it up to make a nice spherical shape and trim any longer ends. 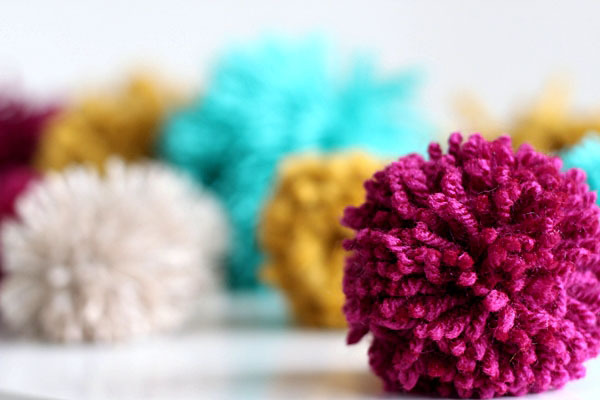 For a more solid look to your pom-poms, just keep wrapping more yarn in the earlier wrapping stage. 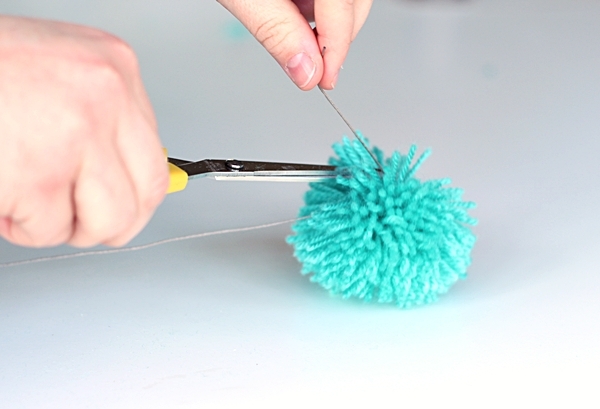 Keep practicing your wrapping technique and make as many pom-poms as you need for your mobile. This will depend on the size of the intended space where your mobile will hang, as well as the size of your branch and how densely you want your pom-poms to hang. We made a total of 23 pom-poms for our mobile. 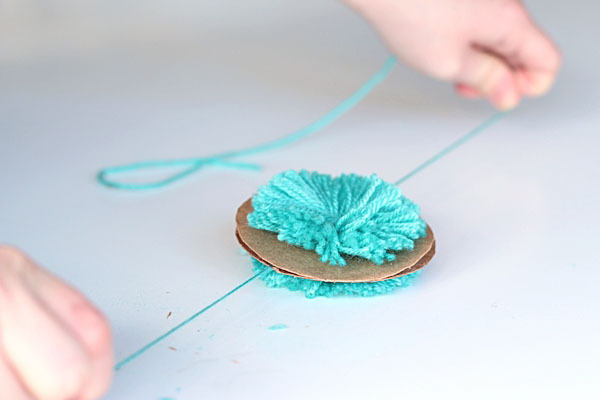 Make your pom-poms using all five complementary shades of yarn you've chosen, as well as all three sizes of cardboard discs. For colour palette inspiration, look at the colours used in a picture or painting in your room, or the colours of your cushions. Using a variety of different yarns in varying materials and thickness will also add textural interest to your mobile. 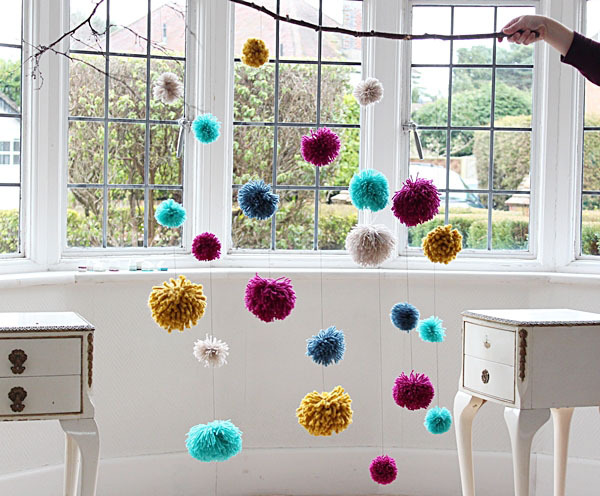 Once you've made all of your pom-poms, play around with how you want your pom-poms to hang. You might need to use the floor for this. Make sure your arrangement looks balanced by ensuring the different colours and sizes are evenly spaced. Once you're happy with your arrangement, cut a long piece of thread about 1.5 metres (60 in.) and tie the first end to the pom-pom you want to hang at the bottom. 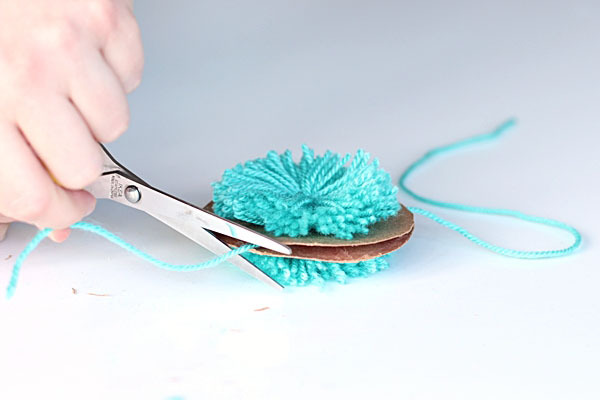 Wrap it around your pom-pom and knot it a couple of times. Cut the shorter end of the thread. 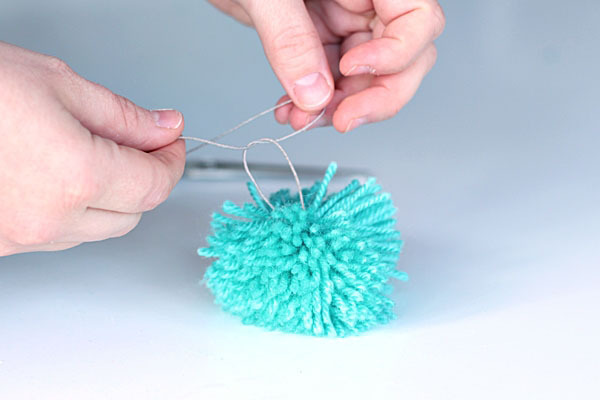 Wrap the longer end of the thread around the second pom-pom by fixing it to the height you want it to hang. Knot it securely. 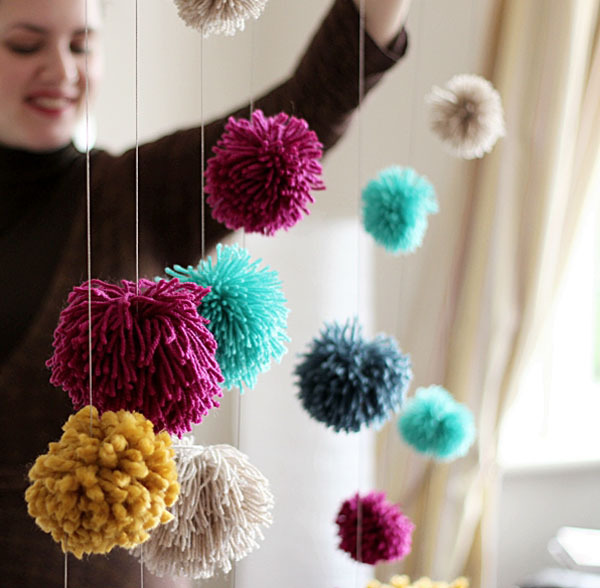 Repeat if you want more pom-poms to hang from the same thread. 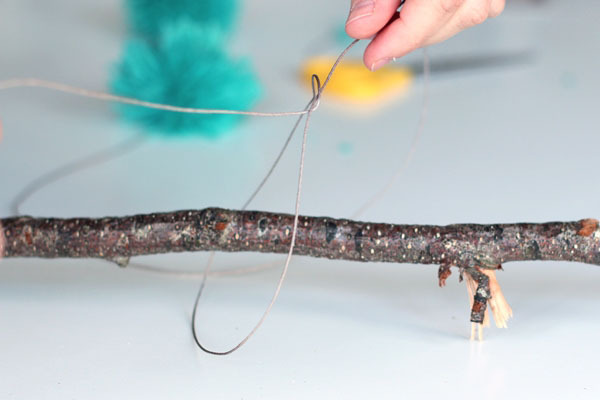 Lastly, tie the thread to the branch and trim the remaining end. 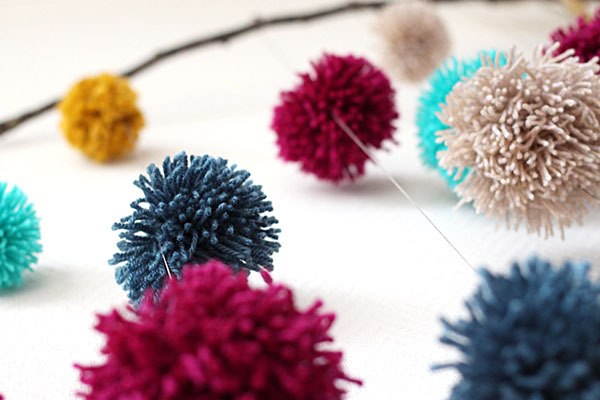 Secure the rest of the lines of pom-poms to lengths of thread in the same manner, and hang them successively from your branch. Ensure each line is evenly spaced along the branch. 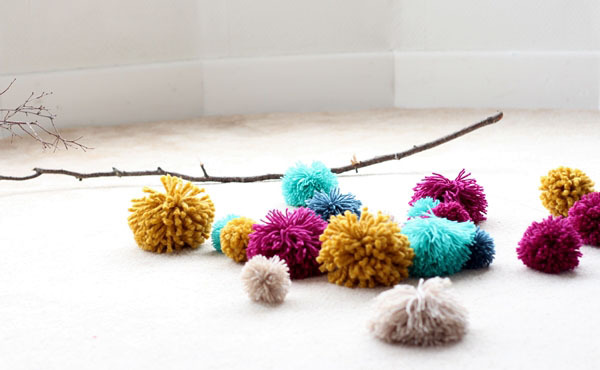 Now your brightly coloured mobile is ready to be hang and fill your home with pom-pom happiness. You might need to use two temporary hooks to secure it to your wall. Alternatively, you could hang it from hooks in your ceiling. 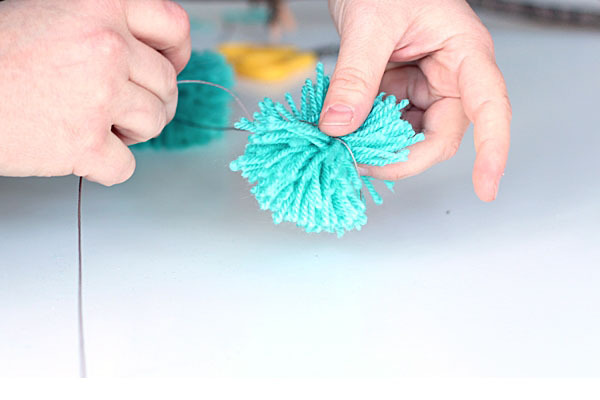 In this tutorial you learnt how to make a basic pom-pom. Now you can try experimenting with adding more (or less) yarn, and you can also create different patterns by wrapping different colours. 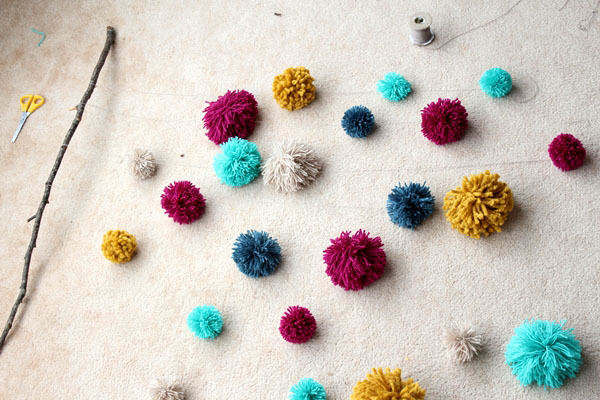 Let us know how you go with making pom-poms. 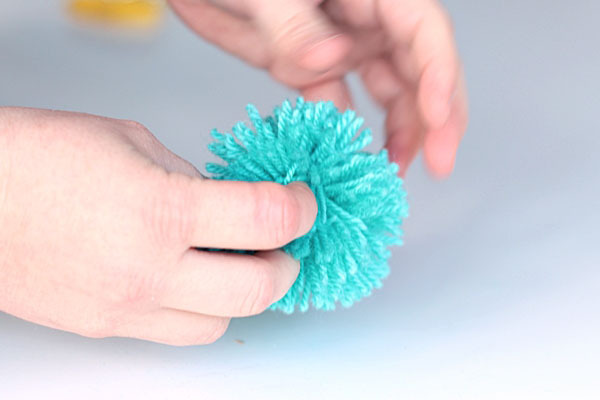 Or share your own pom-pom making tips and tricks in the comments section below. We'd love to hear your ideas.